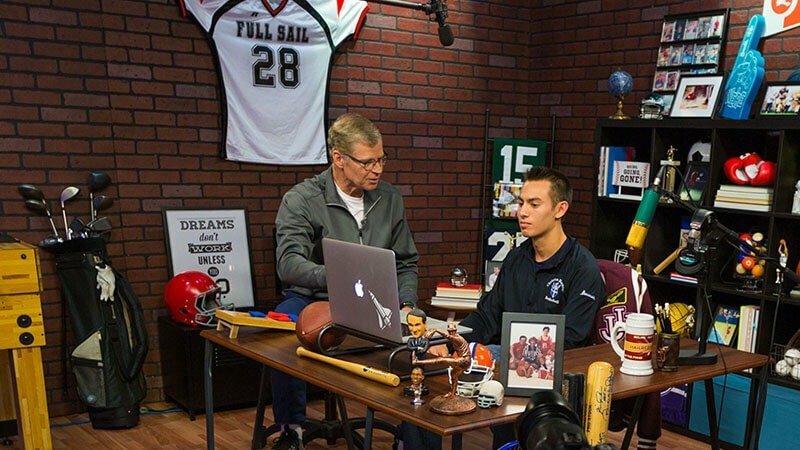 2018 got off to a monumental start at Full Sail University, as the year kicked off with the launch of the Dan Patrick School of Sportscasting. Throughout the year, the calendar was filled with workshops by legends in the sportscasting industry, celebrations for some of the world’s largest sporting events, and new partnerships. Here, we take a look back at some of the exciting events that happened in 2018. In January, The Dan Patrick School of Sportscasting welcomed its first class of students, both on campus and online. Full Sail University hosted the Big Game Celebration in the Full Sail Live venue for students to cheer on the two best teams in the NFL. In February, Dan Patrick, the legendary Emmy award-winning sportscaster behind the school came to campus to work one-on-one with the new class of sportscasting students. In March, Emmy award-winning former SportsCenter producer – and Program Director for the Dan Patrick School of Sportscasting – Gus Ramsey was inducted into the Rollins College Sports Hall of Fame. Dan Patrick checked in with students on campus in June and worked with them individually to provide feedback on their progress over the past six months in the program. David Steele, voice of the NBA’s Orlando Magic for 30 seasons and Fox Sports Florida’s play-by-play announcer, joined FOX NFL Analyst Charles Davis on campus to relive some of their favorite plays in the school’s Play-By-Play Seminar. Full Sail University hosted a World Cup Party for students to watch the final game and celebrate the world’s largest sporting event. Legendary sports columnist, analyst, author, podcaster, and founder of The Ringer, Bill Simmons, stopped by campus in August to speak with students on how to establish your own identity within the industry and answer any questions they had about working in sportscasting. In August, Dan Patrick returned to campus with one of the hosts of ESPN’s SportsCenter, Sage Steele, to host a seminar with current and prospective sportscasting students. They spoke to students about breaking into the industry, barriers to succeeding, and provided advice for how to navigate their future careers. The Dan Patrick School of Sportscasting announced a new partnership with Rollins College in September that would allow current students of the sportscasting program to be the official play-by-play announcers for all sporting events at Rollins, providing them with real-world experience. SportsCenter anchor and host of Baseball Tonight, College Football Live, and Outside the Lines, Kevin Negandhi, joined program director Gus Ramsey to speak with current students about the importance of diversity in the industry and where he sees the broadcasting business heading. In October, world renowned vocal coach Arthur Joseph worked with students currently enrolled in the Dan Patrick School of Sportscasting’s Vocal Awareness class on how to best utilize their most important tool. ESPN’s Jay Harris was interviewed by two current sportscasting students in a lecture on campus about his career journey and the steps he took to be successful. In addition to attracting some of the biggest legends in the industry to host private seminars and workshops for students, Full Sail University's Dan Patrick School of Sportscasting also added six new course directors to its faculty. Jeff Schaetzel, Rishi Barran, Mac McDonald, Mark Condron, Debbi Taylor and Jamilla Herring all bring a unique perspective of the sportscasting industry and skillset that will prepare the school’s students for what they’ll experience after graduation. If you are interested in joining Full Sail University's Dan Patrick School of Sportscasting in 2019, you can find more information about the degree program here.